Batman had The Joker, Sherlock Holmes had Moriarty, I have………slugs! Yes my gardening nemesis of 2012 is the humble old slug. Until this year, a slug was a mild inconvenience to be kept away from brussel sprouts and hostas but our soggy summer has provided sluggy nirvana leaving my garden looking like the set from a horticultural horror film. Caught red-handed eating the potatoes! Followers may recall back in May (when we still thought the wet spring was just a blip) I blogged about home-made methods of deterring slugs…crushed eggshells, coffee grinds, beer traps, bran, human hair, citrus peel, sharp sand, copper tape….the list is endless. Looking back, I laugh at my naivity ha ha ha ha ha. All that is left of the potato shaw! However, I take some delight….sorry, comfort… in reading about many professional and celebrity gardeners who are also suffering at the hands of our slimy sluggy pals. The only people rubbing their hands with glee are the garden centre owners who have experienced a 74% increase in sales of slug pellets. Even a landscape gardener friend bemoaned the fact that this is the first year in 30 years of gardening he has had to use slug pellets. Estimates indicate the slug population of the UK has increased three-fold and, if that was not bad enough, apparently now we are being invaded by a voracious, aggressive Spanish super slug which is breeding with our native slugs to create a powerful, highly fertile breed that will overrun the country…aaaarrrrgggghhhh! 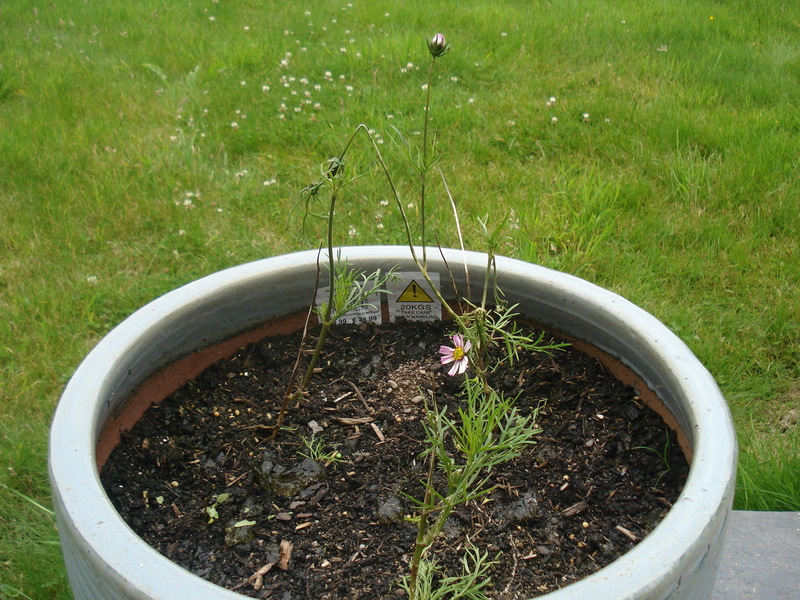 This pot originally had 5 cosmos flowers in it. ironically I was worried they would be too crowded in one pot! For me though, slug pellets are just not an option. We have cats, the neighbour’s two dogs (who frequently run through our garden when they escape! ), numerous varieties of birds plus deer, foxes, squirrels etc. I walked around the garden one evening. Now picture this analogy…a pod of hundreds of dolphins breaking the waves as far as the eye can see…now for the waves substitute my front lawn and for the dolphins substitute slugs. That is what it looked like. 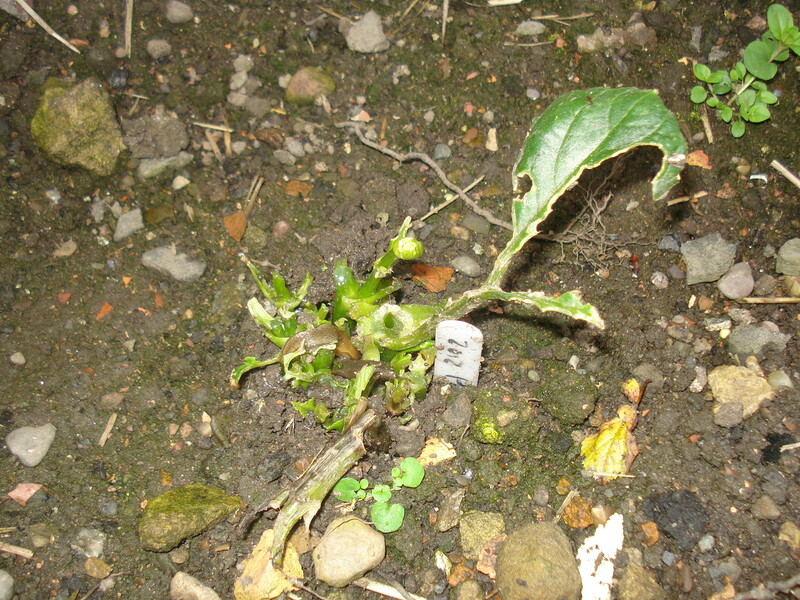 This is all that is left of one of my dahlias. Originally I had 13, now I have 3! I put my gloves on, got a 9″ pot and wandered round the garden picking up every slug I could find. Then I dropped them into a bucket of water thinking they would drown. I was sad but it was them or my veggies and I’m not giving up cauliflower cheese for anything! The next night I did the same but when it came to “bath time” I found 15 slugs that should have drowned the night before, climbing out of the bucket! They are indestructable! This guy actually took the time to try all of the methods and prove (with photographic evidence) that none of them work. The only sure way to get rid of slugs is to slice them in half. Coincidentally, the next day I heard Terry Walton, BBC Radio 2’s allotment gardener, on the radio saying he goes out at night with his knife and cuts them in half. Brutally, if they are dead, they are not eating your plants! So every evening, just as the lights fades, I dig deep (pardon the pun) and bring out my Freddie Kruger alter ego…Fifi the slasher princess…and I either jump on them with my wellie boots on and squash them or cut them in half with the scissors. 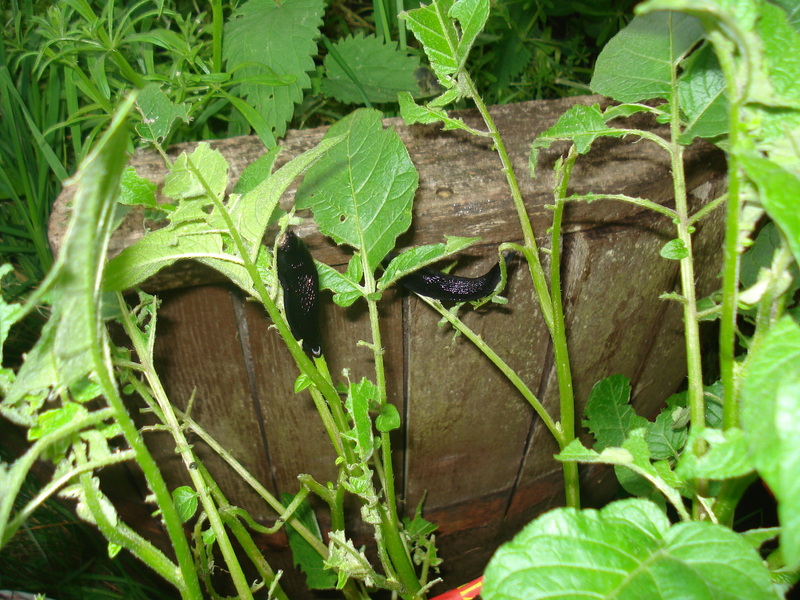 It was horrible at first but I console myself with this comforting fact, gleened from a man who has dedicated his life to finding the best way to eradicate slugs…….slugs are high in protein and all that “green” that they eat is high in nitrogen. 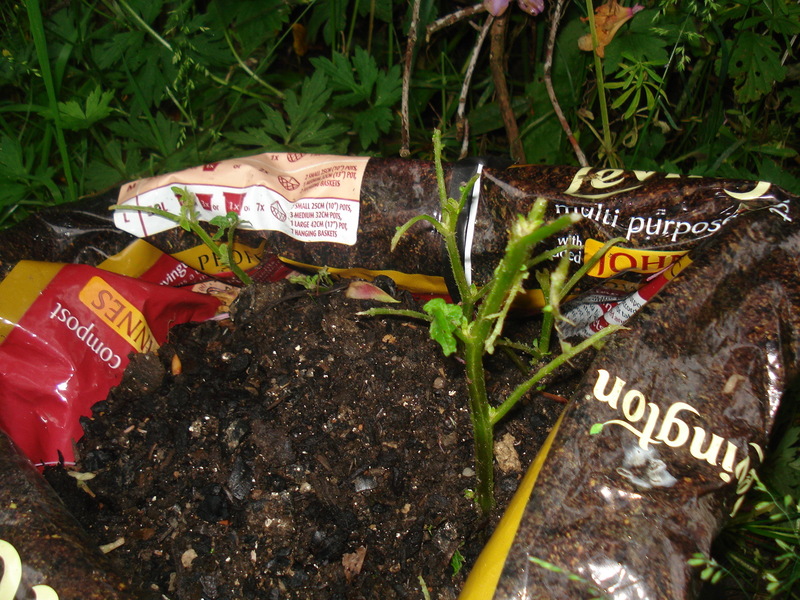 Better to reuse their resources and recycle the nutrients back into the garden. I reckon by next year I will have the most fertile garden in the country! My blue wall seems to be orange and purple! My little sister emailed me yesterday and pointed out I had not posted anything for a while. I realise this is true but there is a reason. Every time I sat down to write something all I could think about was the awful weather, nothing is growing and how the garden is being eaten alive by slugs. I am one of life’s positive people – irritatingly so sometimes. My glass is always half full etc etc etc but when midsummer night came and we were sitting in the dark with the fire on – normally we would be sitting outside until after 11pm – even I found it too hard to think of something positive. Since then, the temperature has risen to a level that is still below average for this time of year but slightly warmer than the record breaking coldest June on record levels experienced recently. And there has been the odd sunny spell. It is still very wet, that combination of heat and damp that conspires against straight, shiny hair (ladies, you’ll know what I mean), but that is why scrunchies were invented. So last night when I got home I wandered round the garden looking for something positive to tell you all and, despite recent adverse conditions, there is some good news. My experiment growing early carrots and peas inside the greenhouse has paid off and I now have lots of the sweetest petit pois and Autumn King and Purple Haze carrots to eat. The spinach and pak choi are also ready for eating. The tomatoes, lettuce, rocket, basil, coriander, peppers and chillies are all making progress, the aubergines are in the bed in the greenhouse and I have flowers on my melons (ok how many of you are hearing Kenneth Williams saying “ooh matron!”). Outside, the brassicas are happy and there is beetroot, fennel, beans, peas and mangetout. The strawberries, raspberries, gooseberries and blackcurrants should be ready for picking soon and the potato bags have already been filled up to cover the shaws. 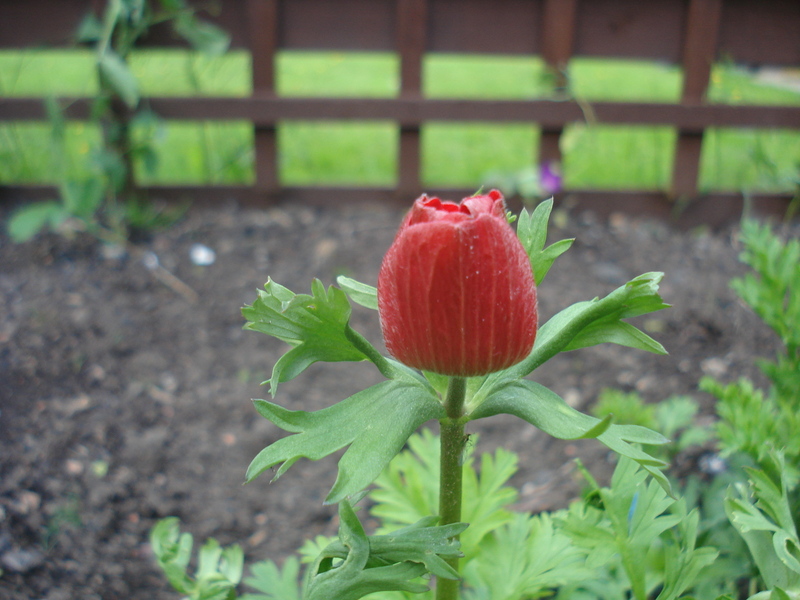 On the flower front, I have still not finished planting all my seedlings, but most of what I have planted has been eaten by slugs. I have turned my focus to the winter flowering pansies and perennial flowers for next year which are all germinating nicely inside. Finally, my biggest surprise came when the flowers on my blue wall started to come out. I dedicated a trellis and the border in front of it to be only blue flowers to see if I could create a wall of blue flowers. 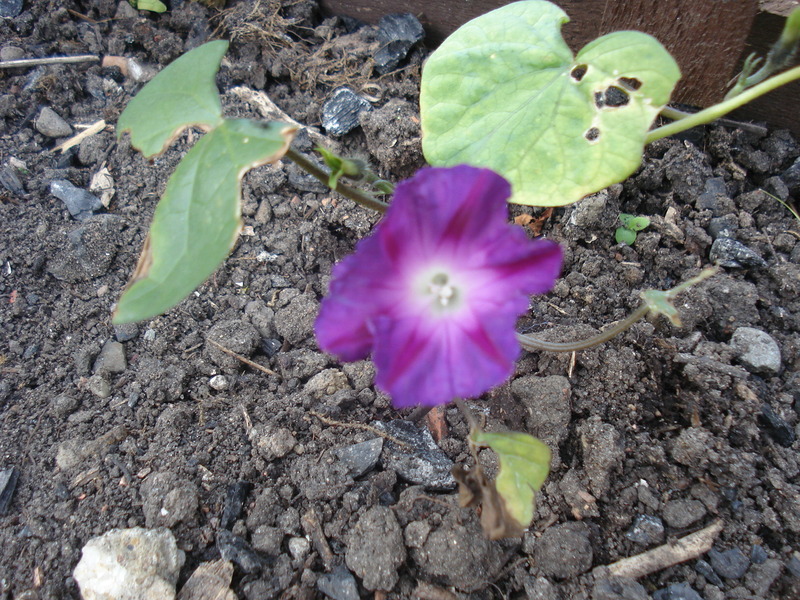 For the climbers I picked blue sweet peas and a variety of morning glory called Grandpa Otts – a lovely royal blue flower. In the border I have planted blue and white anemones, white cosmos, silver dust, salvia, catnip (not that there is much left after Dennis has eaten it) and, when they are a bit bigger, my lavender that I have grown from seed. Well the monring glory flowers have started to come out. What colour would you say this is? In my book this is purple! However, at least purple is closer in the colour spectrum to blue than this anemone! My blue and white anemones appear to be orange!!!!! But after the season we’ve had so far I am just delighted to have any flowers.